2019 year marks the 37th annual Sandcastle Classic on Ocean Beach, the biggest sandcastle competition in Northern California. Leap was established in 1979 in response to severe budget cuts in arts programs in California schools. These cutes continue to affect arts education in our schools today, and the need for high-quality arts programs is now greater and ever. Leap’s programs place professional teaching artists in classrooms to work with grades K-5. Every year, these education programs – in music, dance, theater, creative writing, visual arts, and architecture – serve over 6,000 students in more than 25 elementary schools throughout the Bay Area. 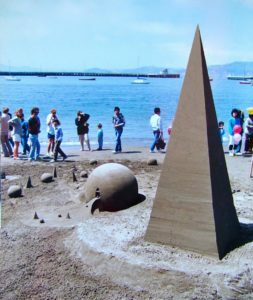 1983 – The FIRST Leap Sandcastle Classic!